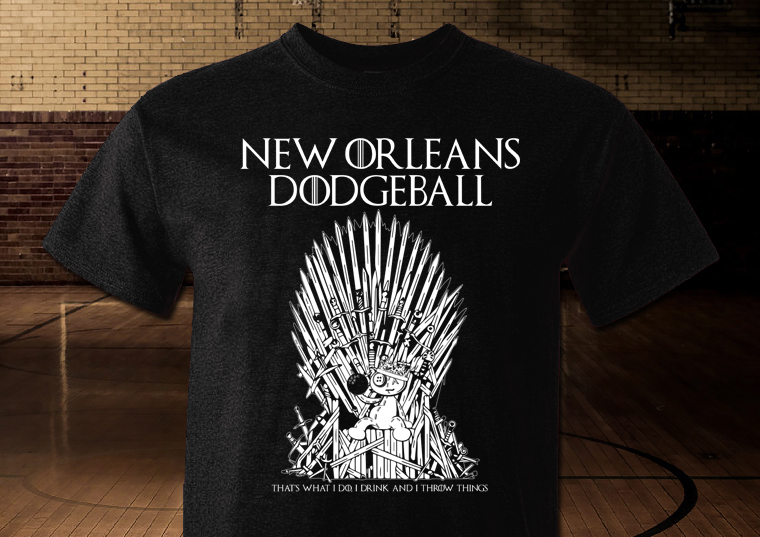 NODA is excited to announce that we have partnered with playNOLA to bring you the upcoming Spring 2019 Dodgeball Season! If you're thinking "Holy crap, what does this change?" The quick answer is, "Not much." VERY IMPORTANT: Since registration is no longer going through us, we will no longer be NEARLY as lenient on late registration, as it will sort of be out of our control. Please sign up on time or miss out completely! Preview of the Game of Thrones inspired shirt for the Spring 2019 season! We are going back to our normal “no-sting” dodgeballs for this league as well as going back up to 8 vs 8 for the team sizes (this may be changed depending on registration numbers). For info and questions not listed below, feel free to message us on facebook or email us. Game Format: Each team will play two 25 minute matches each league night. Free Agents and Small Groups of Friends (maximum 4 veterans), and full teams (for new players) are allowed to register together. Current drink special is Happy Hour extended through the night! * NODA has a zero refund policy. We will not extend refunds, except under extreme circumstances. We are happy to transfer your registration to another player free of charge before the season starts. It is up to you to work out any monetary exchanges with players taking your spot.